Residents of Armyansk in the north of the occupied Crimea report new emissions of toxic substances into the air. Journalist Ksenia Babich wrote on her Facebook page that a real ecological catastrophe is observed in the city. According to Babich, there was a new chemical release into the air, which is why local residents, including children, got burns. Babich refers to the words of the residents of Armyansk saying that it is impossible to stay outside as face swells in 15 minutes. At 15:30 today, October 11, a rally is scheduled in the city. Moms with small children who cannot leave Armyansk are going to attend it. Also, according to Babich, local residents no longer trust any reports that the situation in Armyansk has returned to normal, nor local “authorities”. Residents of the city complain of poor health in social networks. According to them, strange precipitations and odors have reappeared in Armyansk, however, the “authorities” do not react to this at all. Network user Yana Babenshova, for example, writes that in the first microdistrict of the city "stench makes breathing impossible." Twitter user RoksolanaToday & Crimea has published photos of children who have recently got a rash and allergies. Doctors say - this is due to toxic emissions into the air. All small children and partially adults, depending on organism, were diagnosed with extreme allergic reaction and acute laryngitis of toxic origin. Meanwhile, the “head” of the annexed Crimea, Sergey Aksyonov, stated that the plant Crimean Titan could resume work by the end of the week. According to “Deputy Minister of Ecology of the Crimea” Natalia Sologub, October 12 is a tentative date of launching the plant at full capacity, but everything will depend on how quickly Moscow will get approval. In turn, Deputy Minister for Temporarily Occupied Territories and Internally Displaced Persons of Ukraine, Yuri Hrymchak, said on one of the TV channels that chemical emissions in the occupied Armyansk occur with a certain regularity, since the consequences of the man-made accident at the Crimean Titan plant have not been eliminated. In late August, residents of Armyansk began to complain about the environmental situation in the city. Overnight rust appeared on metal objects left outside. People began to massively suffer from allergies. 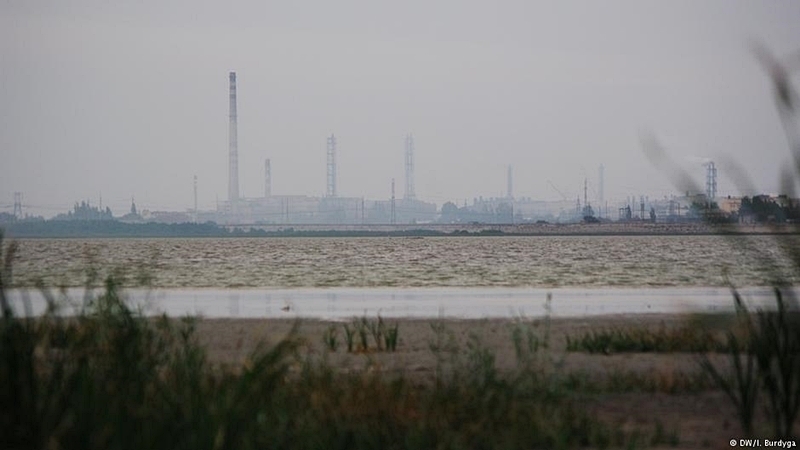 Soon, the “authorities” of the Crimea declared that acid pollution of the Krymsky Titan plant had caused the pollution. September 4, self-proclaimed head of Crimea Sergey Aksyonov made an official statement stressing that the situation was not an emergency and nothing threatened life and health if the city residents. On September 14, emergency mode was introduced in the city, and on September 23 it was canceled. Children were evacuated from the city to the sanatorium on the South Coast of the Crimea, initially placing them in unsuitable living conditions. The Ukrainian authorities have declared their readiness to accept children from Armyansk to the sanatorium of Kherson region. Sergey Aksyonov said that the plant Crimean Titan should compensate for the costs incurred by the city as a result of an emergency. The Prosecutor's Office of the ARC filed a case in connection with air pollution in Armyansk. Private company in Crimea requests Ukraine to investigate the dam damage at the "Crimean Titan"